Athens bands have become as much a part of the community’s culture as the mighty Georgia Bulldogs. This musical clout was brought to bear recently to help preserve a massive historic landmark in the midst of a tough economy. The Georgia Theatre’s resurrection and re-opening in August is a testament to the city’s community spirit and a sign of bigger things ahead for the Classic City. It also underscores the key role music and entertainment play in the economic life of the state’s best-known college town. Originally a YMCA built in 1889, the Georgia Theatre sits right in the middle of downtown Athens, across from one of its coolest bars, The Globe. (Esquire named it one of the Best Bars in America in 2007.) Around one corner is the 40 Watt Club and the Caledonia; around the other corner is Wuxtry Records and The Grill. The theater’s location and its pedigree, like Atlanta’s Fox Theatre, make it irreplaceable, which means owner Wilmot Greene faced an enormous challenge when the theater was gutted by fire in 2009. It was a difficult decision to redo instead of rebuild – the cost of historic preservation is astronomical compared to a nightclub construction budget. But theaters have outlasted many courthouses as the oldest downtown landmarks throughout Georgia, and to generations of UGA students, the Georgia Theatre is hallowed ground. Now relaunched with help from The Georgia Trust for Historic Preservation, it has doubled in capacity and stands to be a huge shot in the arm for the city’s economy. The Georgia Theatre, a cinema house for 100 years, also became a music venue in 1989. It was popular with many of the local “jam bands” of the period, including Widespread Panic, Allgood Music Company, Downright and Northern Lights. Wilmot Greene was there in the beginning, and his heart never left. “It was a crazy position to be in,” says Greene. “We knew we were going to need help, but we couldn’t just take people’s money.” The outpouring of support was substantial, and several benefit shows were staged, including one by The B-52s at The Classic Center. The theater celebrated its re-opening in August with a two-week schedule of performances that encompassed a deliberately wide variety of artists. “Georgia Theatre has been the heart of downtown for 122 years and a continuous music venue since 1989,” says Greene, although it hosted its first live musical shows in 1978. He picked up-and-comer Madeline and local favorites The Glands for opening night; the schedule also included superstars like Big Boi and Chuck Leavell. “We wanted to make it as local as possible as well as varied. We just wanted to please everybody, which is impossible – but we love that people get real emotional about music. Real emotional. We got ragged on Twitter really hard for our opening schedule. With so many UGA students and alumni having an emotional stake in the theater, “It’s a landmark not just for downtown, but for all of Georgia,” says Athens Downtown Development Authority Executive Director Kathryn Lookofsky. Georgia Theatre is still taking donations, Greene says. Donors can fork over $100 for a plaque on the wall of history. There is no limit to the donations the theater can take until it is debt free, and Greene stresses that the donations are restricted to the historic preservation aspect of the construction – which he guesses is somewhere between 40 to 60 percent of $4 million. The redone and improved Georgia Theatre features a new entrance lobby and a big new balcony, but many of the original touches – such as the original stained glass, warped by the fire – are incorporated. “The balcony is a lot bigger, which is where we gained capacity.” This is likely to increase ticket prices. “We’re interested to see if Athens can support higher ticket priced shows, but I think they can,” Greene says. The shows will be held earlier, which doubles the potential ticket-buying audience, he says. The new theater also features a rooftop restaurant with a menu by White Tiger Gourmet owner/barbecue expert Ken Manring, open from 11:30 a.m. until 2 a.m. With all the new improvements, Greene emphasizes that this Georgia Theatre incarnation will be a profitable one. The block now has more continuity, says the DDA’s Lookofsky, and more retail, giving the theater a sort of mini-mall effect. Waffle House, Mama Goldberg’s Deli (an Auburn, Ala., institution), Fuzzy’s Taco Shop and Yoforia will be opening in the ground level of the parking deck; Flight, a tapas bar, opened on Lumpkin last year. The top floor of the deck will be used by offices, with local company Partner Software among the first tenants. In all, some 300 to 400 jobs have been created in the $16-million project. 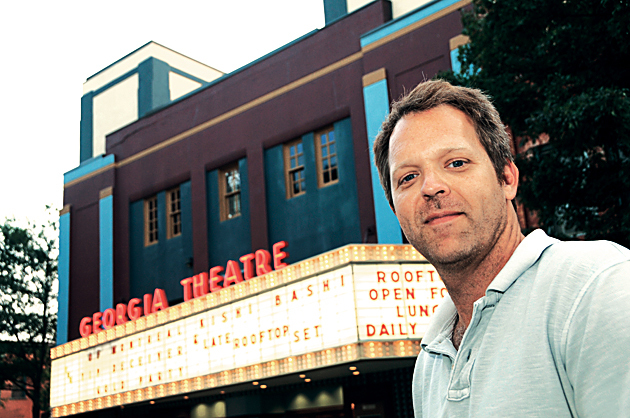 Georgia Theatre benefited from a number of innovative fund-raising promotions, such as Terrapin Brewery’s Georgia Theatre Sessions – four different beers released over the course of last year. Athens businesses have a way of looking out for each other. It’s a mutual admiration society, says Julia Weckback, marketing director of Terrapin Brewery. “We’ve had a lot of support in Athens,” she says. The brewery tours are especially popular. The success of the tours reflects a broader success for the brewery, which gets its name from a Grateful Dead album. Terrapin recently surpassed microbrewery status to become a regional brewery, which requires sales of more than 15,000 barrels per year. Terrapin sales topped 18,000 last year. “We’ve been growing like crazy,” says Weckback. The popularity of Terrapin reveals a built-in crowd of locals and students to support the local economy – a “buy Athens” movement without any campaign. That audience will continue to enhance Athens as a tourist destination, says Hannah Smith, communications manager of the Athens Conven-tion and Visitors Bureau. “I definitely think that Georgia Theatre reopening will reinvigorate tourism,” says Smith. “There is a lot of action in that part of downtown.” There is also a lot of synergy to build on among the venues, restaurants and CVB-sponsored events that are gathering momentum, such as AthFest. Other signs indicate an economy on the rebound. A new French restaurant, Etienne Brasserie, opened on Broad Street this summer to great reviews, says Smith, but what really has the town jumping is a new Steak ‘n Shake planned on Broad between downtown and Five Points. “There was a lot of excitement when that was announced,” says Smith. The Classic Center has a great schedule this fall, including David Sedaris this month, and is beginning its own expansion. “When we are finished in spring of 2013, we will have doubled the size of the exhibition hall, and we will have closed in the courtyard that is currently between theater and exhibit hall to serve as new pre-function space,” says Smith. There’s news on the local healthcare front as well: UGA is also part of Georgia Health Sciences University’s plans to create more doctors in Georgia. There are 40 students in this year’s GHSU/UGA class in Athens. St. Mary’s Hospital and Athens Regional Medical Center are both growing in the same area. Athens Regional recently welcomed its first new President and CEO in 29 years, Jamey Thaw, and St. Mary’s is growing its network of affiliated physician groups, most recently Athens Internal Medicine Associates.